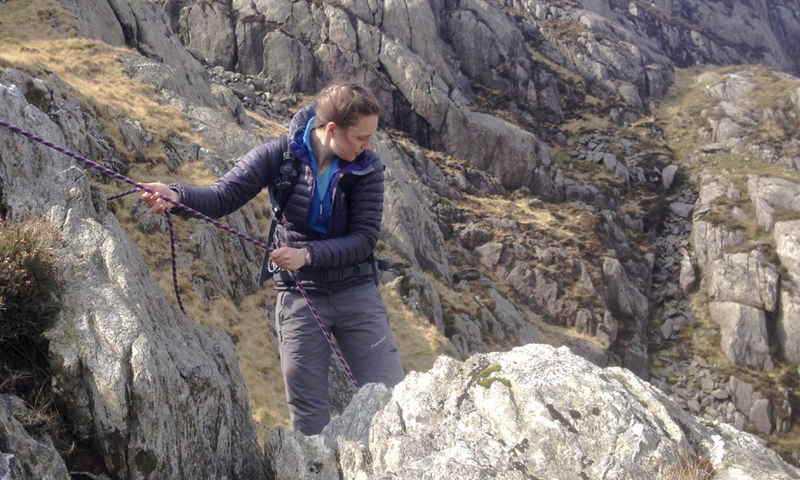 Moving on from route finding and party management on steep ground, this post takes a look at rope-work skills used when ascending steep and broken ground. It’s good to remember that the planned use of the rope is beyond the scope of the mountain leader award. You should be planning your steep ground days with good route planning and selection as your aim; however, you need to have the rope-work skills in place in case something goes wrong. If you find yourself in the wrong place, rope-work could well be the best and safest option to redress the situation. My tip is to put in some extra practice on rope-work skills, so that if all does not go as planned on your mountain day, your skills are at a good level to sort out the problem without adding to it. Choose the right rope. Select one that is strong enough, long enough, has enough stretch to absorb impact and is thick enough to grip. Top tip: Ideally, use a kernmantle climbing rope. A 10mm diameter rope about 30m long works well. Store your rope effectively. To have quick and easy access to your rope, store it tangle free and ready to use. Top tip: A method that works well and one that I’ve noticed a lot of leaders use is to feed the rope into a rope bag or stuff sack, with one end of the rope out of the bag for easy access. Keeping your rope bag at the top of your rucksack can also save you time. Attach the rope with a suitable knot. A figure of eight is a knot that is frequently used; however, it’s not that easy to adjust. The bowline is also a popular knot, but if tied incorrectly is not safe – and also requires a stopper knot to safely lock it off. Top tip: My favourite knot, one that I’ve often seen used and that works really well, is an overhand knot; nice and simple, easy to adjust and safe. This is a fundamental and vital skill for a mountain leader, not only for the safety of your group members, but also for your own security. Choose a suitable anchor. The biggest problem in selecting a suitable anchor on broken ground is choosing one that is the right shape and size, and that is also solid. There are numerous choices e.g. spikes, boulders, threads and trees. 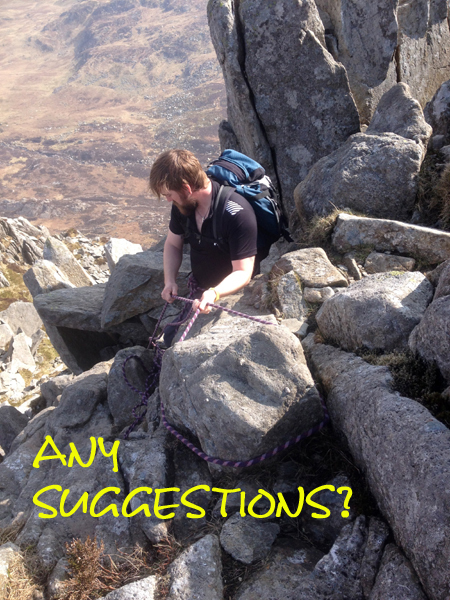 Be in a suitable position – (in line – anchor, belayer and scrambler). This will prevent the scrambler acting as a pendulum if they slip, preventing the belayer being pulled sideways. This position also gives the belayer an unrestricted view down the scramble. Be the right shape, so there is no danger of the rope slipping off, or of a sharp edge cutting the rope. Be solid, so that there is no likelihood of the anchor moving under load. If, after considering other alternatives, your options are limited to having to use the rope, there are a couple of options in belaying that are open to you. Group members are in safe place. Make sure they’re not directly under the scramble while waiting for their turn. You are tight on the rope. The rope between you and your anchor should be tight when in belay position. If the rope is at or below waist height, you are sitting to belay. The live rope (from you to the scrambler) is placed over your head, so that the rope from you to your anchor will prevent the live rope from slipping under you. You are wearing gloves. 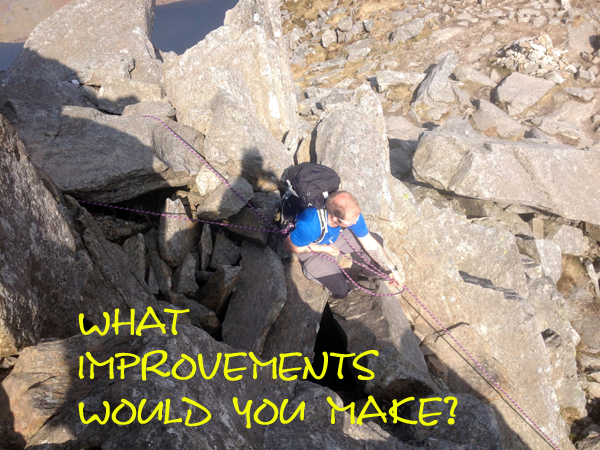 Wearing gloves when belaying can save unnecessary rope burn, as well as improving your grip. Keeping your arms covered when waist belaying can also prevent rope burn. You keep taking the rope in, so there is no slack between you and the scrambler; if they do slip, then it will not result in a fall with shock loading on you and your anchor. If sitting to belay, bend your knees and brace your feet in the direction of force, if possible. Have a safe area for scramblers to sit or stand when finished. Most groups that I see out on steep ground days show some great skills in their route finding /selection. I very rarely see them using ropes unless they are on courses or putting in some practice. 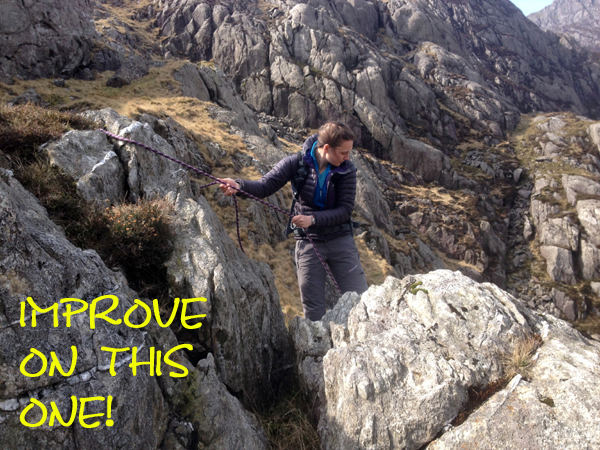 This just goes to show that most are switched on to good steep ground skills and judgement! All photos thanks to ML training candidates.